Today's Draw: Crow Woman (Justice) from the Mythical Goddess tarot in the position of What to Take From the Past from the Deck of 1000 Spreads. Are you thinking more and more about getting older? What have you noticed has spelled the difference between you now and you 20 years ago? And if you're in your later 50s, 60s or 70s, what difference have you noticed in your life since turning 50? In a few weeks I'm going to turn 50. Everyone my age is doing it, if they haven't already. It's all the rage these days. This isn't something that normally bothers me...aging. It's just a number. But when it's a big round number...like half a hundred...you get to thinking. In my spirit, I'm still girlish...forever 29. Visibly I don't know how old I look, but it's young enough that it shocks people when I tell them how old I am. But physically speaking I'm sure I feel 65. Or 70. It's fair to say I've been a bad steward of my body and and excellent steward of my spirit. The rest is just genetics. So with 50 looming and an aged goddess staring at me in Crow Woman in a position like "What to Take From the Past", well...I'm back to thinking about 50 again. 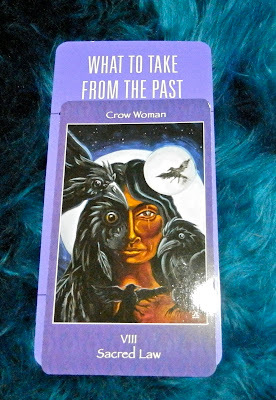 And Crow Woman has some wisdom for me...for us, the members of the high school Class of '81, many of whom bless me by reading this blog on a regular basis. She comes to tell us we've evened out over the years. We're not so full of drama and histrionics. We can see situations more objectively. We're less attached to things. We're more adept at honoring our boundaries. We're also less likely to compromise our truth. Somewhere out there there's a 30 year old reading this and thinking "pathetic old dogs, searching in the dark for reasons to be glad they're living in wrinkled, graying bodies"...haha. That's ok. I thought that when I was your age, too. I thought, "hey, I get to be 30 and all those things you say." But I can see now where I was wrong. It's a sad irony of life that, just as our bodies and looks begin to deteriorate, we finally discover that "inner beauty" people have been talking about all along. I thought I knew it at 30, but now I can see what a child I was, still at 30. I thought I knew it at 40, but now I can see how full of fear I was at 40. I suppose when I'm 60 I'll laugh at how naive I was at 50. But more and more as 50 draws near, I'm beginning to appreciate the stability and confidence I have now. And I expect only to blossom and grow as my gray hairs become more prevalent. As someone who has actively been on a path of personal growth and spiritual discovery for more than half my life, I can look back astounded at all the progress I've made. The things that used to clutter my head no longer do. The things that used to define me as a person no longer do. Some of the people and situations that I embraced then would not stand a chance in my life today...and I'm sure there are some things I rejected back then that I might have more of a propensity for today. From a spiritual standpoint, this whole aging thing is beginning to make sense in ways it never has before. It's like we spend a good 30-some years developing fears, neuroses and insecurities, only to first, reach a point of stasis, then begin to overcome and slough the scars of our youth in our later years. It's hard to appreciate something you've always possessed. But if it's something you've earned, it becomes a precious gift. In the first half of life I earned my neuroses, only to earn my way out of them in the last half. All of it, a gift. So, as I pack my baggage for a new decade, I bring all of it with me, really. Because before any scale reaches balance, it tips first to one side, then another. If we are to be balanced out, we need the weight of both ends of our life opposing each other. There's something deep in my core that tells me I'm right on schedule to be 50 and experience some of the best years of my life...maybe not in looks or physical wellbeing, but inside. Where, it turns out, it really does count.